Chocolate Turtle Pie just got a whole-foods makeover, and the results are fabulous. 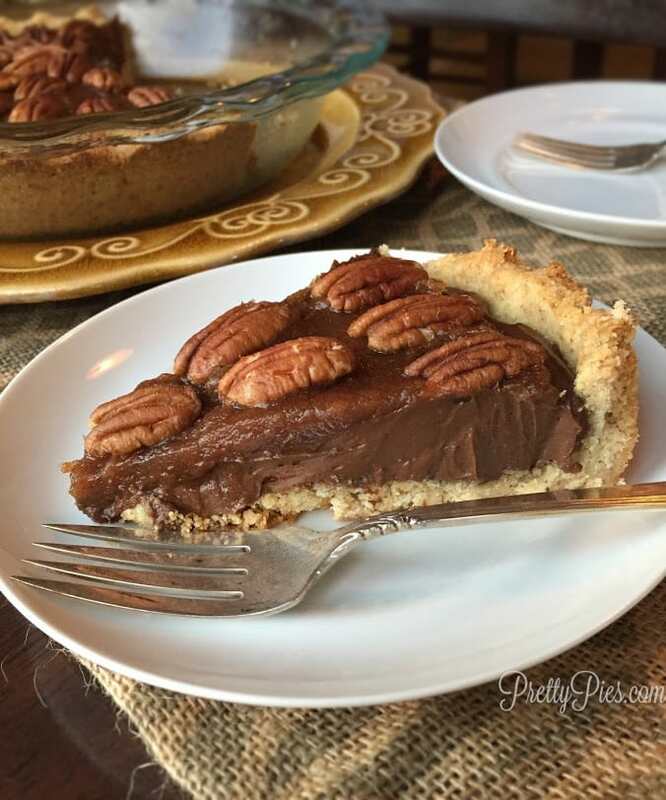 Unlike traditional pies full of processed ingredients with bleached-this and canned-that, this recipe has zero grains, gluten, refined sugar, dairy, or eggs. So it’s vegan and Paleo-friendly and something most everyone can enjoy. Yay! What’s it made of? You would never know by tasting it that the chocolate is made with avocado! YES. So it’s loaded with nearly 20 different vitamins, plus super healthy fats. (If you’ve never had an avocado pie, you’re seriously missing out. They’re SO irresistibly smooooth.) 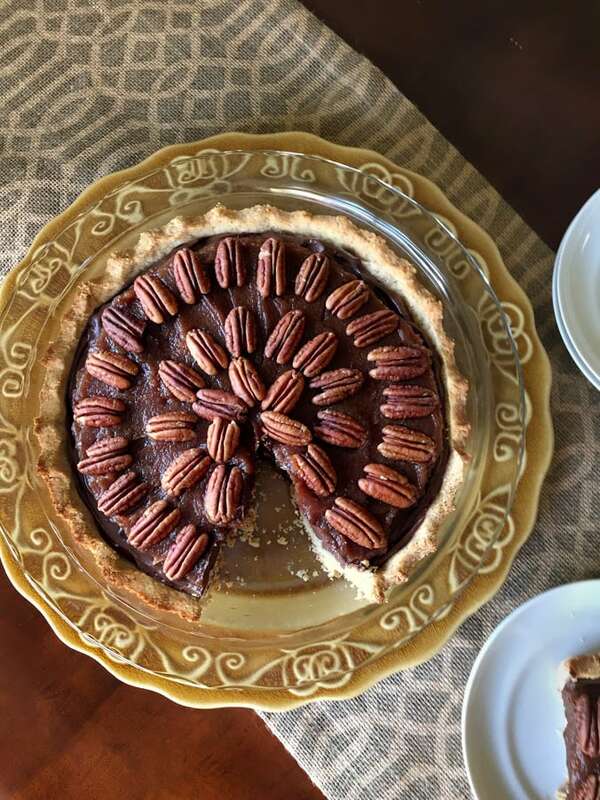 The silky chocolate avocado is spread on top of a crisp, buttery crust made with almond flour and topped with vegan caramel made from dates! Avocados, nuts and dates are not only incredibly nutritious, but fiber and protein-rich. That means it’ll fill you up so you won’t be tempted to overindulge (the struggle is real.) One slice of whole-foods dessert is completely satisfying. Another plus of fiber-rich desserts is they won’t spike your blood sugar and send you into a vicious cycle of sugar crashes and cravings. That’s the beauty of whole food desserts! That’s why I’m so passionate about real food (and Pretty Pies! )– because your body reacts SO differently to processed food vs real food. Emily Spain is a mom of two littles, a wife and the creator of PrettyPies.com— delicious desserts that are not only good to look at, but actually good FOR you! She’s a whole-food fanatic, coconut lover, and veggie-hiding ninja. You can follow her on Facebook, Instagram and Pinterest. Guilt-free goodness made with healthy ingredients. 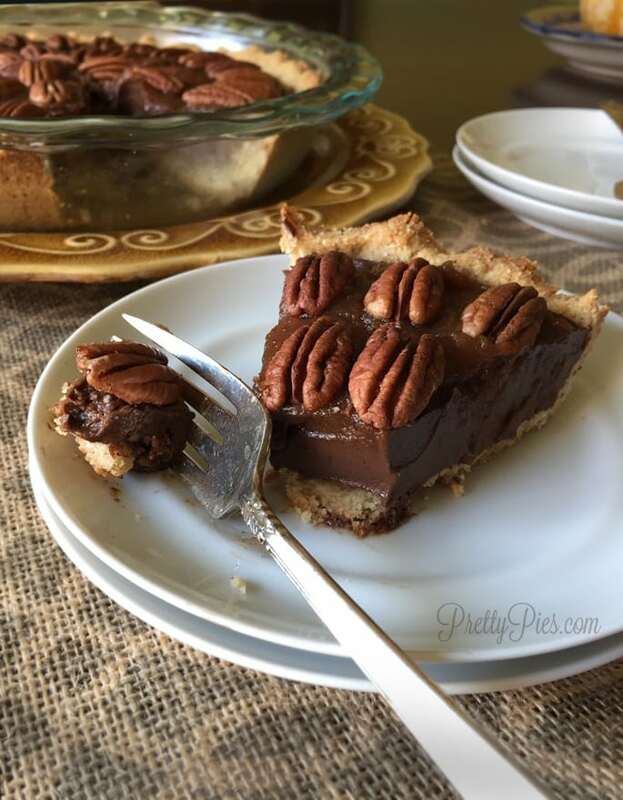 A rich chocolate pie covered in smooth caramel and toasted pecans. Vegan, gluten free and paleo. Preheat oven to 350. Lightly oil a pie dish . In a mixing bowl , combine flour and salt. In a small cup, combine flax, water, oil and maple syrup. Pour wet over dry and mix well. Press into pie dish. Bake for 16-20 minutes until lightly golden. Set aside to cool. Add avocados to food processor and blend well. Add warm oil and remaining ingredients to taste (add more syrup or cacao, if needed). Spread over cooled crust. Set in the fridge while you prepare the caramel. Place pitted dates in a small bowl and cover with water (about 1/2 cup). Soak for 30 minutes. Remove dates from water and place in food processor, but SAVE the water. Blend dates, vanilla and salt then stream in water and until desired consistency is achieved (I used about 3-4 Tbs). Spread caramel on top of chocolate layer. 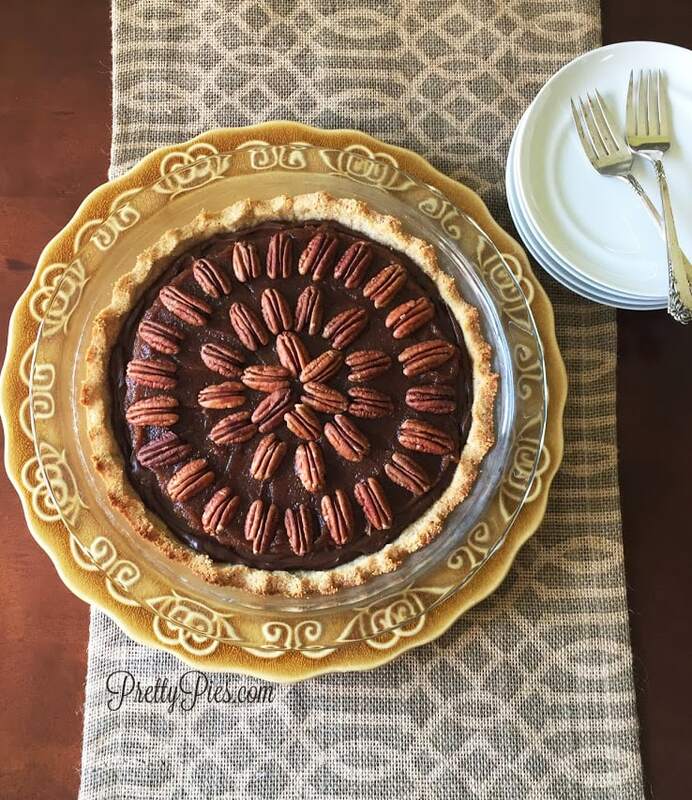 Decorate with pecans. Refrigerate for 3 hours to set. Enjoy! Should keep about 5 days in the fridge, but it's best consumed within 2-3 days, since the crust will soften slightly the longer it sits. A quick and easy way to toast pecans: Place them in a dry skillet over medium heat for about 5 minutes, stirring occasionally, until fragrant and golden brown. This looks incredible-- and so healthy, too! I love the idea of freezing it, as well. YUM! Me too! Can't wait to make it. This pie is AMAZING!!! I made it to celebrate the night my mother-in-law arrived in town. It got such glowing reviews that it may become a new Thanksgiving tradition at our house. It may sound silly but I can't tell you how much it means to foodies like me who find themselves needing to get off of gluten, dairy and refined sugar to have recipes like this to share with friends and family. Thank you!